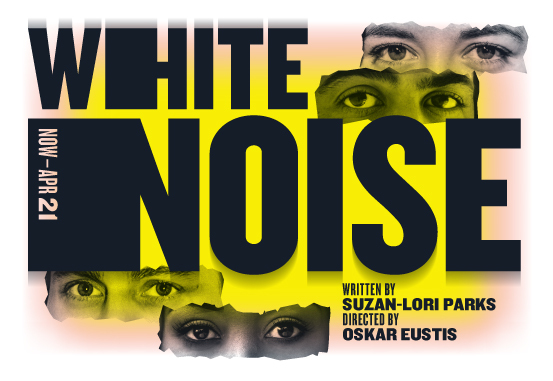 Following her critically-acclaimed trilogy Father Comes Home from the Wars (Parts 1, 2 & 3), playwright Suzan-Lori Parks (Topdog/Underdog, In The Blood) returns with a world premiere play about race, friendship, and our rapidly unraveling social contract in White Noise. White Noise, gives each of its characters a monologue that explains their points of view. 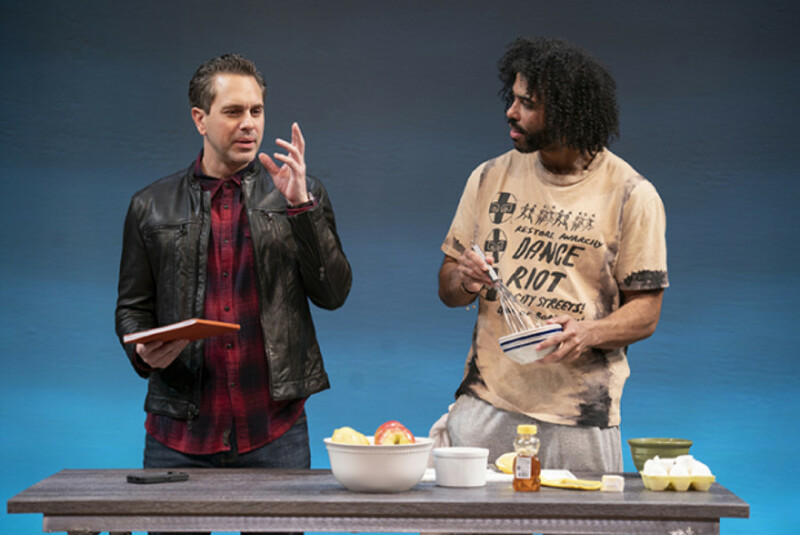 For the most part this play is a smart take on how wounds fester so deeply that we unconsciously do not even realize they are there. 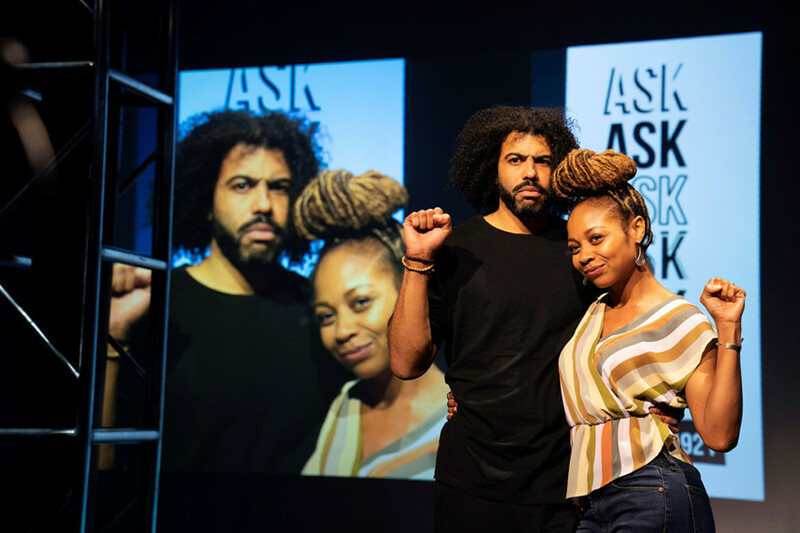 Leo (the incomparable Daveed Diggs) explains why he can neither paint or sleep. Turns out a unthinking alcoholic school teacher triggered something in Leo’s brain and he snapped. He stated: “I’m the fractured and angry and an edgy black visual artist.” When he is roughed up by the police while talking a walk, he comes up with a radical approach to making his life make sense. Leo talks his best friend, Ralph (Thomas Sadoski), a well to do, white college professor to pay $89,000 (the price of Leo’s student loans) to rent him as his personal slave for 40 days. This might not have been the best idea, as Ralph was just passed over for a promotion and sees this as reverse racism. Like Leo, Ralph has writers block. These once four friends hit major road blocks. The master/slave roles allow both Leo and Dan to create, Leo to sleep and things of course to shatter everyone’s lives. Once the antique slave collar is introduced the show seems weighed down by too little and too much. The cast is all winning and at the top of their games. I especially loved Sheria Irving ‘s hysterical performance. 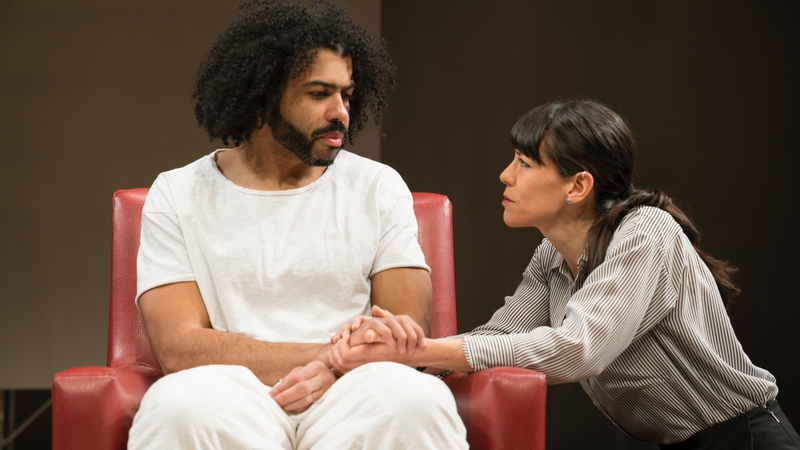 Oskar Eustis direction is a lot of fun, as the cast sends bowling balls down real lanes brilliantly designed by Clint Ramos. Sadly the women’s characters are not fleshed out and the second act becomes predictable. We are in a major crossroads with how we deal with our pasts and how we move forward with our future. In watching this play I wondered if this can ever be accomplished if we can not forgive and start fresh. White Noise: Public Theater/Anspacher Theater, 425 Layfette St. until May 5th.